Carol could see Mr. Larson was different from the other high school instructors. Yes, he was much younger, more handsome, with a pair of piercing, green eyes, but his appearance wasn't what struck her. Mr. Larson had seemingly original ideas, many of them, concerning life and its possible meaning, and now and then they slipped out into the chemistry class he taught. For her it ceased to be a dull class, when he came out with an observation off the cuff like: "The world was created by evolution. Someday man will know there is no God." Wow! It was like a bomb had exploded in the room. Everyone could go on separating and combining various compounds and chemicals as if the Universe hadn't flip-flopped at that moment, but she couldn't join the idiots. She just stared at him, her eyes wide. Who else but Mr. Larson would dare to make his views known in that way? Her heart pounded as she went up after class to ask him about what he had said about God being dead, or, if not dead, out of the creative process that made the universe and everybody in it. She had to know if he really believed it. No one she knew had ever expressed such a view, and Mr. Larson was unique in her view--even extraordinary. How many men were extraordinary? So far she knew of only this one, and so she just had to talk to him! Mr. Larson did not take her questions with humor and condescension, she found with great relief. Instead, he explained in detail exactly what he meant by his shocking statement. When he had finished, her admiration for him had grown. Not only was he a professed atheist, but he had carefully reasoned out his position. How many Christians had carefully reasoned out their faith in that way? She felt she was treading on new ground, and the feeling was thrilling as much as it was frightening. Where would her questioning of him lead? Would her faith wither and fail before his skeptical analysis and be proven childish? She felt the great challenge and the real possibility it could fail, but she couldn't, despite that, run away like an intellectual coward. She had to find out one way or the other who was right, she or Mr. Larson. Whatever the consequences, it would be better, she decided, than believing what wasn't true. As long as he had time after class, she questioned, listened and argued, questioned, listened and argued, as Mr. Larson set forth and explained his evolutionist philosophy. "Some day man will know there is no God who has created everything," he said to her. "In times past anything that could not be ex;plained was said to be God-made--fire, lightning, all unexplained phenomena. Little by little, man discovered the scientific causes for such things. Before mankind comes to an end, he will have discovered how to make man. Therefore, there will be no need for a God. Slowly man is finding out to make every human part." Carol argued the Bible's case in defense of God the Creator, but Mr. Larson did not believe the Bible to be valid. He told her of many teachings that were found at the same time as the Bible was written, and these contemporary, conflicting teachings differed from those arbitrarily selected to form the Christian Bible. Which teachings about Christ were the correct ones? Who could possibly tell that, after two thousand years? Besides, he said, there were other men who did quite the same things as Jesus was claimed to do: preach, train disciples, heal people, perform miracles, and so on. Why was Jesus any different? He wasn't! Christianity had tacked on divinity to a rather ordinary man, and made him what he wasn't, the Son of God. It was all a fabrication, and Christianity was based on it. A thinking person, he concluded, couldn't possibly be a Christian if you knew these facts, which were common facts known to scholars who took the trouble to study the times and cultures of Jesus' background. Until a person took the time and trouble to study the times and culture that produced Christianity, he couldn't be taken seriously in an intelligent discussion of the issues. Carol put off her music coach's training after his class just to keep up the discussion. She was late when she finally ran to the session. Mr. Larson had really given her the full thrust of his attack on Christianity. After demolishing the existence of God in favor of evolution, ridiculing the idea that Jesus was different and the "so-called Son of God" when he was no more than an itinerant rabbi, and throwing grave doubt on the Christian canon of the "so-called Holy Scriptures," he had attacked prayer when she only happened to mention that prayer meant a lot to her because she knew she had received a number of answers, personally, through prayer. Years later, even over in the high, red hill-country of the Fulani tribe in Cameron, Africa, she could still see the fresh, handsome looks of Mr. Larson with his eager eyes fixed on her as he showed her the absolute certainty of his views. "Prayer," he said, with a gleam in his green yes, "is only positive thinking, and when you pray you are only going as far as your own mind. You are convincing yourself more and more of the thing that is the subject of your prayer. The only reason for the invention of Christianity is that it is the best rule that man has found to live under. There is no life behind our earthly life. We have heaven on earth. Heaven is what you make it. And if you make yur life hell, that is your own doing. Your only soul is in your mind, and when you die, it dies." Mr. Larson, gathering his books to go to his next class in another wing of the high school building, paused and looked out the large windows fronting one whole side of the room. He pointed to the sky where clouds were covering the sun on an overcast day just as clouds were threatening to cover the last remnants of her own childlike faith. "There are more planets in the Universe than there are grains of sand on this earth. When this earth is gone, others will be inhabited. Life everlasting is only the inhabiting of these billions of planets which will go on forever. Well, that is enough for now. Carol, it's been a delight, but I must cut this off for now. See you later." "See you later!" She wasn't sure, hearing that, she wanted another such session. As she took the bus home, she sat, her mind whirling with the things he had said. She could hardly keep her thoughts together enough to do her homework and study for the test in math the next day. She put off the reading of the Bible, which she had pledged in church confirmation class to do daily. "I'm too tired," she thought. Actually, Mr. Larson's ideas had penetrated too deeply, and she was deeply shaken at the core. Could she be right and he, and thousands like him, wrong? Now when she looked at the Bible, she thought she saw inconsistencies and loopholes, in the Lord's teachings and in prayer. Who was right? Where could she turn? Far off on the edge of her mind she thought she saw a light glimmering, but she still couldn't grasp it. High school graduation came, she went on to college. She sat in a religion class, doing the assignment, which was, "What is Your Faith in God, and How do You Maintain It Against Doubt?" Of course, she couldn't help but tell about Mr. Larson and how he had practically destroyed her childlike faith at the time. Since then she hadn't been able to refute anything he had said. She wasn't sure anymore Christianity was the truth. Her faith had failed. The Light had gone out in her life. She went home from that class and intended to finish it over the weekend. How, she didn't know. She couldn't end the paper with unbelief and skepticism, could she? It was the truth, however. 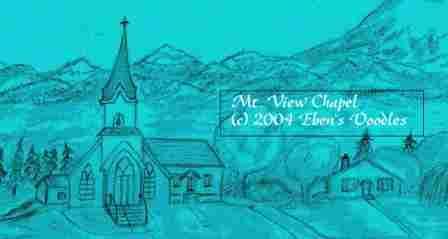 How she hated the idea of attending church now at Mountain View Chapel. The youth group was so boring, she found. Those who came showed no real interest in the activities, and talked about their classes at school. She was a year older now, and couldn't care about their concerns and frivolous interests. None of them seemed to want to know whether Christianity was true or not. They just thought it was a boring subject they had to put up with, because their parents required them to attend church services and activities while they lived at home. Her parents too required the same things, but she had questioned them, whether they knew for sure that Christ's teachings were his or just those tacked on to him by Christian followers who wanted to forge a new religion contrary to Judaism. They couldn't tell her, so she gave up on them. Who else would know? She thought of calling the pastor, but she knew her question would disturb him, and the other members would probably react the same, with shock that she was thinking such heretical things! How could she help not think that way? Mr. Larson had turned her whole world upside down! For over a year she attended church less and less and commuted to college. All she could feel was darkness around her. She came across miracles of faith in newspaper articles and magazines, she read Dale Even's story of her "angel unawares" adopted child being given to her and Roy and then being taken away by God for a mysterious reason of His own, she attended church services as usual, but nothing helped. Prayer and praises were empty now. She groped about, showing her despairing condition at home by letting her room become a pigsty and finally quitting church and prayer and Bible reading and even family prayers. And the pleas of her disturbed, unhappy parents were no help. Easter came, and she couldn't find a valid excuse not to go, so she went along, expecting nothing. The church had a bulletin passed out to everyone, and the usher handed her one as a matter of ritual. She took it and went to sit down, and this time she glaned at the back where there was a "meditation" written. She had seldom if ever read these bulletin meditations penned by somebody up in the church denomination headquarters in Minneapolis where the bulletin formats were composed on a year-round basis. The back of the offering envelope had the same message, she noticed, and it was different from the usual Easter messages about the Resurrection being so important to Christian faith. "Let the faith of a little child be an example to you, unquestioning of God from the Creation on. Like the child's you also may have true faith." The words struck her with lightning force, and a kind of stone rolled away from her soul that had trapped her for months in a dark, dead place. She felt herself transported out of the little white Scandinavian chapel and sent sailing through the vast starry hosts of the Universe. God didn't have to say another word, other than this one word: the Universe! She saw it, and that was enough. Back in her seat, she gathered her thoughts of what had happened to her. It was marvelous, unspeakable. As she began to think of her earliest faith, a light flickered on that never dimmed again. Her search was over--over! At last she had found her way home. Later, in Minneapolis, in France, in subsaharan Africa, whenever she thought about these days and the role Mr. Larson had played, she could only think of him as a bridge that was scenically but pathetically broken like the Pont d'Avignon, the famed tourist site that extended partway into the river. He didn't know he was broken, of course. But, then, he as much as admitted it when he said that this life was all there was, and when it ended, that was the total end of the person, soul and all. She knew how wrong he was! She had found again the bridge to true, lasting life, in the very Man who was the world's greatest bridge. Through absolutely undeserved, unmerited, un-earnable forgiveness he brought all men, at least in the offer, to God who could not accept them in their sin and rebellion. He paid for that forgiveness, he spanned the gulf between sinful man and a holy, just God, with his own life and blood. It wasn't theology for her anymore, if it had ever been. She believed it with all her heart, mind, and soul. And it was something she knew she could die for. 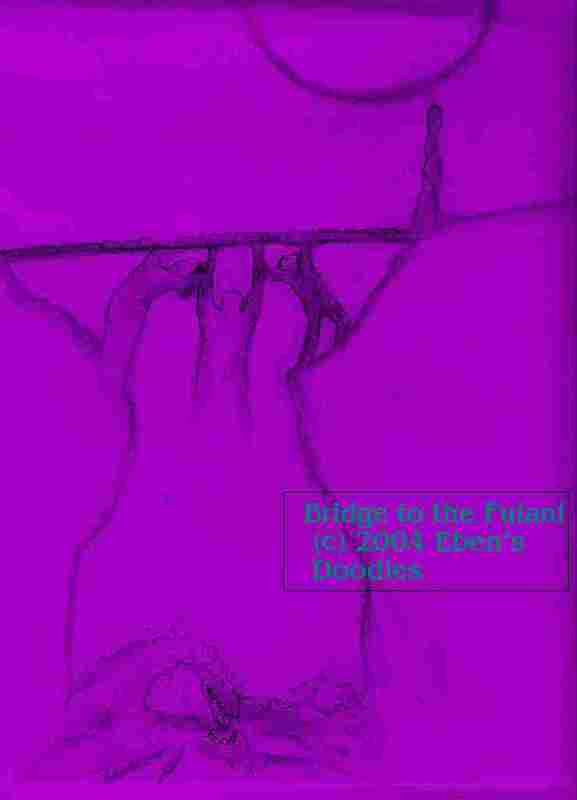 She could paint bridges in France, and the meaning was in each one of them, seeing bright-eyed Mr. Larson in the tumble-down, old, Roman bridges or blown-up relics of World War II, and Christ in the intact bridges, Christ the Bridge who brought two separated sides together safely through forgiveness and reconciliation. Who could not love such a Bridge as Christ? Who could not trust his destiny to such a Bridge? Heaven lay gleaming for her on the other side, and she was going there, she knew, having trusted Christ for her soul from her earliest childhood. Where would Mr. Larson and all the people in the world like him end up? Surely, they would tumble into a vast gulf and be destroyed, for nothing in this world would save them from such a fate. Only Christ could span eternity for a finite, erring human soul. "Why do you paint so many bridges?" Ron asked her one day in Paris. "It's the same subject, over and over. Why not do the other sights, like the Eiffel Tower, the cafes, the lovers in the parks, the poppies, the sailboats, the water lilies, the--" The very thought of doing those ordinary subjects, which had been painted ad nauseum by every street artist for the tourists, made her throw her paint brush at him. He himself had been a bridge of a man, and that was what attracted him to her when he first began speaking as the intern assistant to the pastor at her congregation! He had a difference in his views, he earnestly wanted to reach out to others, not just live self-indulgently and "get ahead" in life like so many of their generation. He even wanted to model his life on Albert Schweitzer the famed Nobel-Prize winner and humanitarian who ran the hospital for the poor lepers in West Africa instead of living comfortably and civilized in Europe, enjoying his fame and career as a world-class organist and Biblical scholar. Ron, because of that, ought to have understood her, but if he didn't, how could she explain it? Her response? She continued painting bridges! And she couldn't sell a single one to justify the expense of the expensive paints and canvas, and they had to be left behind in Paris when they took the flight to Cairo and then to West Africa. In Africa, from the Sahara on down to the Sahel, she found no bridges to paint. The people had to ford whatever stream there was the only way they could, by raft or canoe or plunging through on foot. She thought less and less of bridges then, until one day it dawned on her while she was visiting the huts of native Fulani tribal women who were sick and dying without medical care. It struck her with the same lightning force, just the way she was struck reading the back of the church bulletin about a child's faith being unquestioning. "Yes, that is why we're here, why we studied in Minneapolis, got a degree, then studied in Paris, and finally came thousands of miles to this red hill-country of the Cameroons nobody would give a fig for! It's all about being a bridge! But what do I have to bring to their side? Their needs are so overwhelming. What do we have? All we have is Christ!" She did all she could in the miserable huts, then climbed up to the house above the clouds, weeping. It was her own version of a trail of tears her people had once walked in losing their ancestral lands and being forced onto a reservation. She walked this bitter, hot, tear-stained trail day after day, and the women kept patiently and uncomplainedly dying alone in their dark little, stinking huts while the men tended the herds of cattle and sheep. And the women kept dying, one after the other. Some rallied a bit and would laugh, taking hold of her skin and hair and clothes as if she were a strange doll that had dropped from heaven. Always, after her visits, she climbed home wearily, up her trail, wondering what possible good could she have been, since the women died anyway, or recovered miraculously without medicine. "It is too long a time to put young people out here for six years, she thought miserably. "How are we going to make it that long? We haven't made any real difference in their lives, nor can we," she thought. "The women are still dying alone in their huts. We don't have any facilities or means to get them to make a hospital for them here, and they can't make it all the way in to the nearest hospital. Ron can't take them in the jeep--they'd all want to go, and how can we choose which one will live and which one will die? So how in the world can we change this way of life with mere Christian theology when all this misery and dying has been going on for hundreds and even thousands of years?" The birds came and ate her garden for the second straight growing season, and so she had to replant once again. The hordes of huge, termite-like ants invaded yet another time in full force, showing up throughout the little house. It took hours to get them all out, so she and Ron could sleep without waking up feelin critters running across their covers. She was pregnant too. Should she tell Ron right away in the morning? She decided to keep the news a few more days, for he was having a hard time, she knew. He was wondering what their purpose really was in coming and what hope they were producing, in the lives of the Fulani tribe, just as she was wondering. On the day of what she called her "epiphany," she was taking some time out from her chores of house-cleaning, baking, washing, water purifying, ant-smacking, bird-chashing, etc., when Ron stopped to peer over her shoulder to see what her subject was on the easel. "Oh, no," he groaned, "not another bridge! I think you left at least a hundred of them back in Paris!" This time she had an answer for him. "But, see, it's a a self-portrait, combined, of you, me, and...Christ! It only looks like a bridge!" Ron paused (and he didn't blurt out the first thing on his mind, which was the thing she loved most about this intellectual man of hers). He gazed at her, then a moment later he walked slowly from the room, leaving her to finish the bridge in peace.